In today’s vacuum battle we’ll be comparing 2 of the best cordless vacuums on the market, the Dyson V10 vs. V11. These powerful cordless stick vacuums create great suction, have a 60 minute run time, and come with a ton of accessories. But is the Dyson V11 worth the extra money over the V10? Find out below. Can’t bear the suspense? Click here to jump right to the key differences and summaries! What is the Dyson V10 & V11? 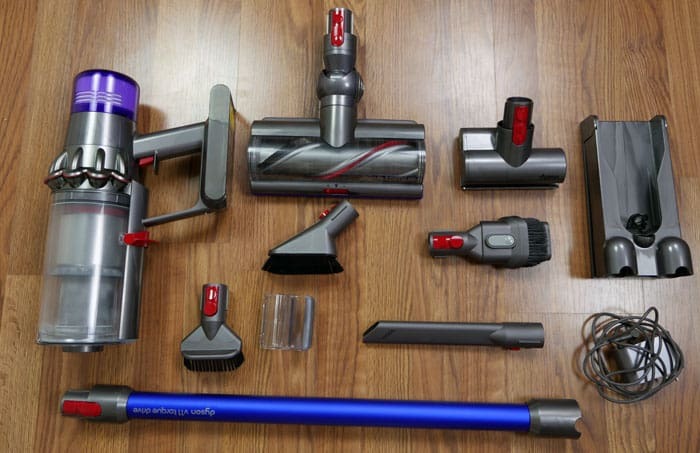 The Dyson V10 and Dyson V11 are cordless stick vacuums and part of Dyson’s V-series lineup. Both the V10 and V11 use a multi-surface brushroll powered by a digital motor spinning up to 125,000 per minute. The design, long battery life, and powerful suction make the V10 and V11 two of the best cordless vacuums on the market. Dyson V10 & V11 in handheld mode. The Dyson V10 released in March 2018 and the Dyson V11 released in March 2019. The Dyson V10 is available in Absolute, Animal, & Motorhead versions. While the Dyson V11 is available in Torque Drive and Animal versions. First up, let’s talk about the design differences. The Design of both of the Dyson V10 and V11 are similar. They seem to be built on the same design platform. Both vacuums use Dyson’s Trigger switch, which powers the vacuum, but only while you hold the button down. This is designed to help preserve and extend battery life. The Dyson V10 and Dyson V11 are 2-in-1 vacuums. 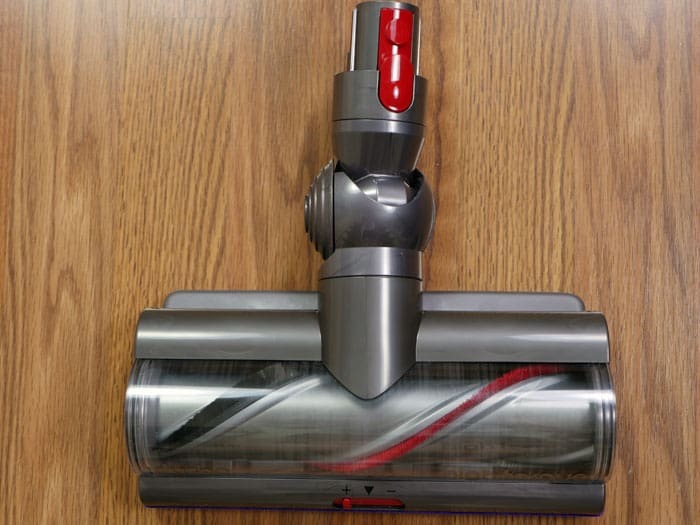 You can use the vacuum as a full-sized cordless stick vacuum or as a portable cordless handheld vacuum. Since the launch of the Dyson V7, Dyson has used a quick release system for all of their V-series tools and attachments. The V10 and V11 use this same system. Perhaps the biggest update to the V11 compared to the Dyson V10 is an improvement in usability. The Dyson V11 adds a digital screen to the back of the V11 motor. Depending on which V11 sub-model you decide to go with, there are a few subtle differences. V11 Torque Drive: The screen on the Torque Drive is LCD and it shows the current cleaning mode, remaining battery life (countdown in minutes), and short performance and maintenance videos. V11 Animal: The screen on the Animal is LED and it shows the current cleaning mode, estimated remaining battery life (as a battery icon, not actual minutes). This model also does not include the performance or maintenance videos. Additionally, the Dyson V11 (in both sub-models) also has an intelligent suction mode. This allows the vacuum to increase / decrease suction based on what the cleaning surface requires. How Does the V10 & V11 Clean? CYCLONE DESIGN | Similar to older models in the Dyson V-series, both the V10 and V11 rely on Dyson’s patented cyclone cleaning system for powerful suction. Both vacuums uses a 15 cyclone system, arranged across two tiers and basically look identical. Unlike older models which located the cyclones perpendicular to the extension wand (like in the shape of a “T”), the cyclones of the V10 and V11 are designed in-line with the extension wand, creating a more streamline look and (according to Dyson) better suction performance. CLEANING HEADS | There is one main difference when it comes to cleaning heads that are included with the V10 and V11. And it can be summed up with one word – Fluffy. 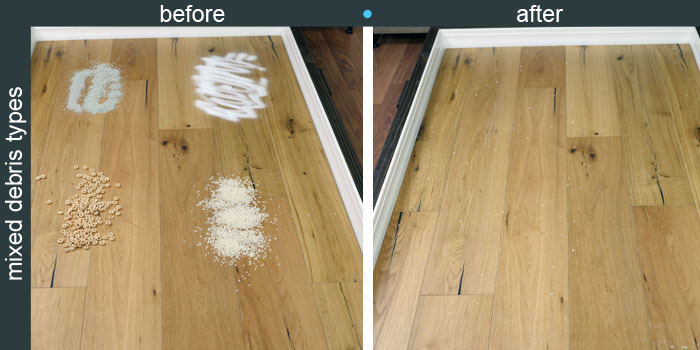 The Fluffy cleaning head was designed specifically for hardwood floors and does a better job of cleaning those floors as well as capturing large debris types, but it’s only included with the V10 Absolute and isn’t included with any V11 models. In all honesty, this is something that I feel is really lacking from the V11. With so many other great improvements that the V11 brings to the table, it seems a little unusual for Dyson to leave this head out of the package. This is especially true because the attachment mechanism is virtually identical from the V10 and V11. The cleaning head that is the same between the V10 and the V11 is the Torque Drive cleaning head. The Torque drive cleaning head uses a spiral brushroll that is better at agitating carpet fibers, while also being safe for hardwood floors. As a side note, the Dyson V10 Motorhead does have a different cleaning head than the others. It includes the Direct Drive cleaning head instead of Torque Drive. This cleaning head is also included with the Dyson V7 and Dyson V8. It removes 25% less dust and dirt than the Torque Drive cleaning head, according to Dyson. The list below is a quick outline of which cleaning heads are included with each Dyson in the V10 and V11 series. 2-IN-1 DESIGN | Both the V10 and V11 operate as as a stick vacuum or portable handheld vacuum. The conversion between stick to handheld is as easy as pushing one button to detach the cleaning head (and wand if desired) and snapping on the correct handheld attachment you want. You can even use the motorized cleaning heads without the wand for great suction when cleaning upholstery or car interiors. RELATED: Check out this quick read for the best car vacuum. How big is the V10 and V11? The difference in size between the Dyson V10 and V11 is very slight. The biggest difference is that the V11 is about half a pound heavier and 0.75″ taller than the V10. What accessories come with the V10 & V11? Like most other categories we’ve reviewed so far, there’s just not a lot of differences between the Dyson V10 and Dyson V11 when it comes to accessories. They both have nearly identical accessories and support the same functions. Please note: The Dyson V10 has a few more variations within sub-models which may not be listed above. The Dyson V10 Motorhead, for example, is the least expensive and includes only basic accessories (crevice tool and combination tool). Aside from the cleaning head, the physical accessories included are pretty similar between the two V10 and the V11. At Modern Castle, we put all of the vacuums through our standard vacuum cleaning tests. These cleaning tests are designed to test a vacuum’s full range of cleaning performance, from large debris to small. For more detailed cleaning testing data please see our full review of the Dyson V10 here and the Dyson V11 here. When cleaning hardwoods, the Dyson V10 and Dyson V11 were extremely similar. 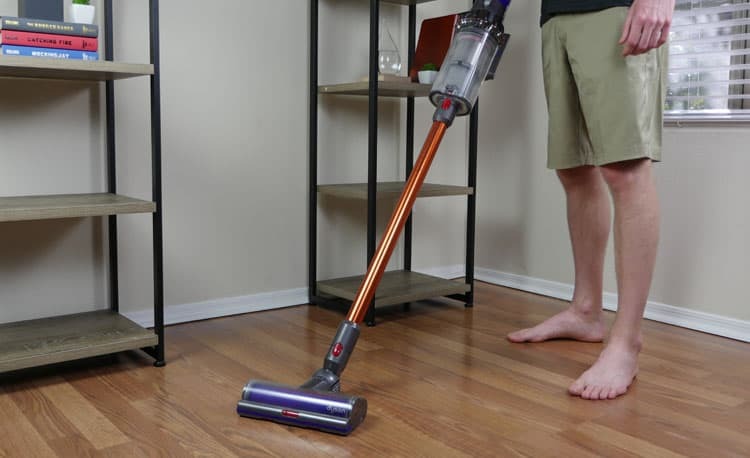 Both models scored between 98-100% on all debris types, making either of these vacuums an excellent choice for vacuuming dry debris (of all sizes) from hardwood floors. What else can we say? 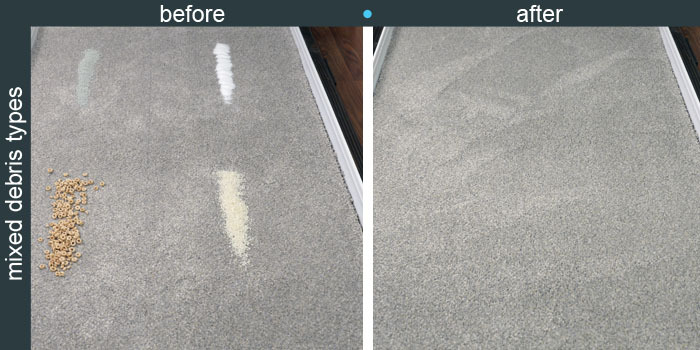 Cleaning performance, even on high pile carpet was simply astounding. Against all debris types, both the V10 and the V11 captured over 99% of debris. How easy is it to use the Dyson V10 & V11? Regarding usability, we began to see a few differences between the V10 and the V11. Both vacuums came mostly assembled right out of the box, besides needing to maneuver a few “quick release” latches to create the exact configuration that we wanted. That being said, the “quick release” latches really are that simple. With the push of one large red button, you can easily snap on / off difference accessories and cleaning heads. It’s an intuitive system and wasn’t hard to operate, with minimal effort. The setup for the V10 and V11 is also virtually identical. You can use the wall-mounted dock if you’d like to hang up your vacuum or just plug the handheld unit into any wall outlet, using the provided charger. Concerning daily use, the V10 and V11 use a lot of the same systems. They both have the “trigger” control for running the vacuum, which helps to preserve battery life. The V11 has the added advantage of the digital screen on the back of the motor, which provides smart details about cleaning mode, remaining run time, and performance and maintenance videos (videos provided on the V11 Torque Drive model only). Emptying the dust bin is basically the same on both models. With both vacuums, it’s a “point and shoot” type of release to empty the dust bin. 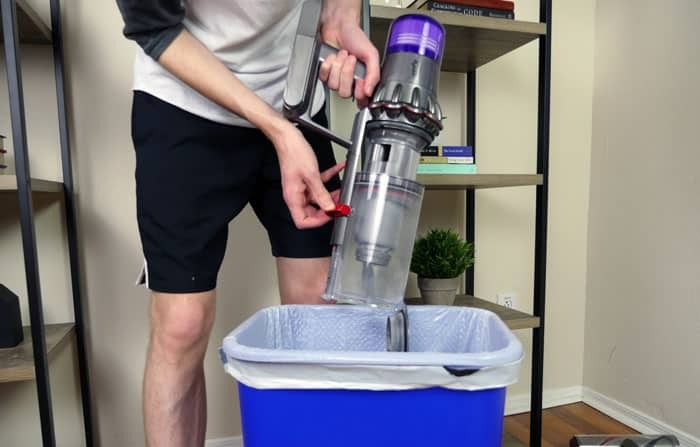 Simple place the handheld over a trash bin, point the vacuum downward and slide the latch. This will open the hatch and forcibly remove the debris inside of the bin. Unlike older models (like the Dyson V6), you don’t run the risk of having to reach your hand into the dust bin in order to pull out lodged debris. Since the V10 and V11 has basically the same size, design, and accessories, their maneuverability is also basically the same. It’s easy to squeeze under low furniture, make tight turns, and clean hard-to-reach places. 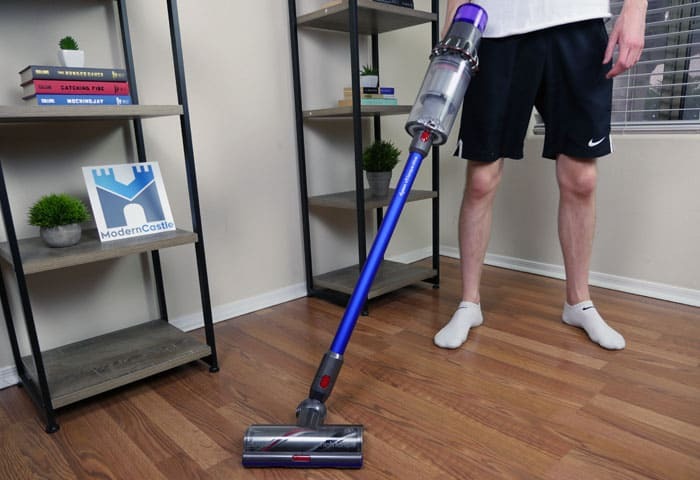 This is partly due to the design of the both of the vacuum, but also partly due to the fact that both of these vacuums come with a wide assortment of accessories that are easy to snap on and go. What are the Dyson V10 & V11 maintenance costs? The maintenance costs for the Dyson V10 vs. V11 are also identical…a big fat zero. Both the Dyson V10 and Dyson V11 will cost $0 / year in maintenance costs. The low maintenance costs are due to a couple different factors. HEPA filters is one cost that quickly drive up the annual maintenance costs of any vacuum, depending on how much each filter costs and how often it needs to be replaced. The V10 and V11 get around this cost by using a lifetime washable HEPA filter. 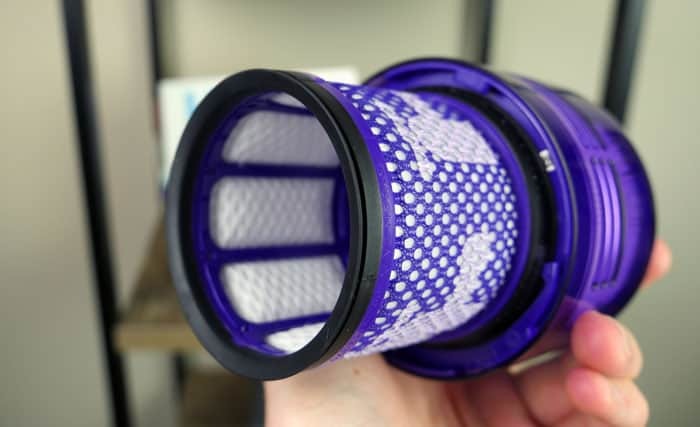 Dyson still offer replacements in case you lose or damage your filter. To maintain them, simply wash once per month with cold water and allow to air dry for 24 hours. The battery is the other area that can get pretty pricey in vacuum maintenance. While the battery in comparable vacuums usually lasts a couple years, the cost to replace it can be high. However with the V10, the battery will last 15 years, as quoted by Dyson’s founder, James Dyson. While Dyson hasn’t explicitly said the V11 battery will last as long, we think it’s a reasonable assumption. Because the battery lasts so long, the replacement cost is basically zero, considering that most users would likely upgrade the vacuum entirely before the battery dies. The battery with the V10 and V11 both has a run time around 60 minutes, sometimes less depending on the cleaning mode and flooring type, but that’s where the similarities stop between these two models. Here is where the V11 scores some points, in my opinion, as there are a few design advantages that this model (which the V10 does not) that may help make the battery last longer. Intelligent suction control: The V11 will automatically adjust suction as it changes flooring types, meaning that you’re never use more suction power (or battery power) than in needed to clean the mess. Remaining battery display: The V11 also has the ability to estimate exactly how much battery is remaining. This helps you to focus on the most important spaces first and know exactly how much cleaning time you have left. With the V11 Torque Drive, this display is a minute-by minute countdown. With the V11 Animal, this display is a battery cell icon that gradually decreases size as the battery drains. Is the V10 or V11 quieter? Concerning noise, the Dyson V11 is quieter to operate than the Dyson V10 , although not by a large margin. Depending on the exact cleaning mode of the V11, the difference can be noticeable or negligible. You can see our exact results below. 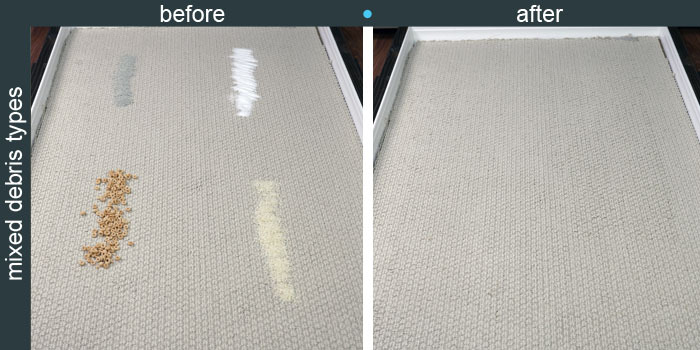 To get these results, we measured the noise output from 3′ away while each vacuum was running on the selected cleaning mode. Concerning value, I would say that there are value advantages to both models and it’s hard to say if one is definitively better of a value than the other. Strictly dollar per dollar, the Dyson V10 does cost less, but there are more factors to consider depending on what you’re looking for. If cleaning performance is your main aim, I would say that the V10 is the better value. This model costs less than the V11 and during our cleaning performance tests, it provided nearly identical results. As an added bonus, this model also comes with the Fluffy cleaning head (if you get the V10 Absolute model) which can be handy in certain circumstances when dealing with hardwoods. If you’re looking for the best advancements in technology and usability, the V11 is the better value. The digital display on the back of the motor is a huge bonus over the V10 and if you want the latest and greatest in technology, you will likely be impressed with the setup and upgrades of the V11 in this area. The Dyson V11 has more raw suction power than the V10. The V11 is able to create 185 AW of suction power on max mode, compared to the V10, which can only create 140 AW. If your home requires more raw suction power to be effectively cleaned the V11 is probably the better choice. Weight 5.9 lbs. 6.68 lbs. So quick summary recap. We’ve highlighted a lot of different areas in this review. Digital Screen: The V11 comes with a digital screen that displays cleaning mode, estimated run time remaining, and performance or maintenance videos (videos available on the Torque Drive model only). The V10 model does not have a digital screen. Suction Power: The V10 model maxes out suction at 140 AW whereas the V11 model offers up to 185 AW. This is the strongest suction we’ve seen from any cordless stick vacuum to date. Intelligent Suction: The V11 also has technology that automatically determines the correct amount of suction needed for a floor type and adjusts the motor accordingly. This helps to prevent wasted battery life in areas where you don’t need max suction. The V10 model does not have intelligent suction. 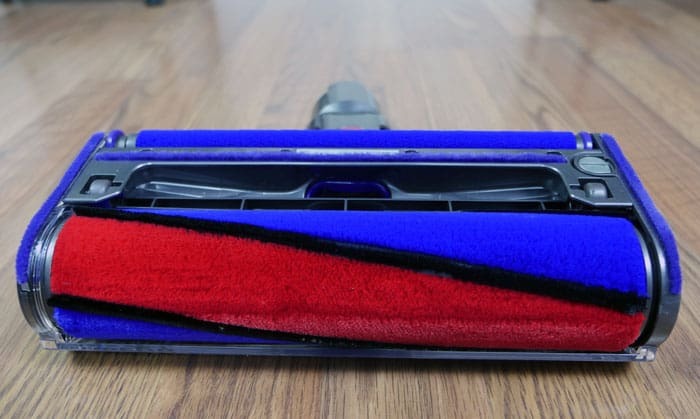 Fluffy Cleaning Head: The V10 Absolute comes with the soft roller Fluffy cleaning head, which can be really great for cleaning up messes (especially large debris) from hardwoods and other hard surfaces. The V11 model does not include the Fluffy cleaning head. The Dyson V10 is an exceptional vacuum and offers many high-end features that other vacuums simply don’t have. It’s lightweight, cordless, and provides excellent suction power and cleaning performance. Want a longer run time – For any cordless stick vacuum, a 60 minute run time is quite long. If you’re running on MAX mode, the run time will be shorter, but still, the time should be more sufficient for the majority of cleaning jobs. Want the Fluffy cleaning head – Compared to the V11 sub-models, the V10 Absolute is the only model that includes the Fluffy cleaning head. This tool is great for cleaning hardwoods. Want a lower price – With the launch of the V11, the price of the V10 is beginning to drop. Simple supply and demand. If you love a good deal, the V10 offers that more by providing the same high-end vacuum that it was last year for a lower cost. For more information or to buy, check out the Dyson V10 here. Should You Buy the Dyson V11? The Dyson V11 is the “latest and greatest” vacuum to come off of the Dyson showroom floor. It has some technology improvements that really shine in comparison to older Dyson models, and certainly compared to anything we’ve seen outside of the Dyson lineup. Want a digital display screen: The digital screen on the V11 is something unique to this model and not something we’ve seen before. The screen can tell you remaining battery life and makes it easy to adjust cleaning modes as needed. Want stronger suction: Compared to the V10, the V11 offers stronger suction, maxing out at 185 AW. The V10 maxes out at 140 AW. Want intelligent suction: The intelligent suction feature makes it easy for the V11 to adjust suction power based on floor type. This feature can result in longer run times for the V11 since you won’t be wasting battery power on floor types where it’s not needed. 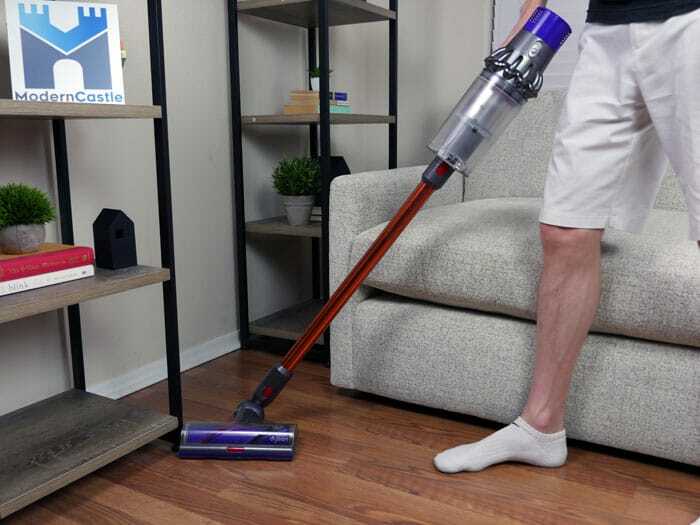 For more information or to buy, check out the Dyson V11 here.